These little remote controlled cars can be powered by three different energy sources: a a miniature windmill, a solar panel, or a hydrogen fuel cell. 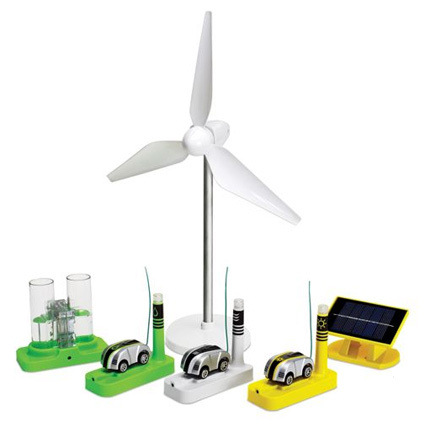 That's a cool way to learn about renewable energy sources. At the moment, these are 33% off, making them $60 USD for the three cars, three remotes, and three charging stations. The wind and solar stations provide up to 20 minutes of racing time from a 10-30 minute charge, depending on wind speed and brightness of the sun; the hydrogen fuel cell provides five minutes of run time from a three-minute charge. The simple remote has left/right and forward/reverse controls, a 10' range, and can be used to charge the cars in one minute when time or natural resources prove scarce. Here's where you can get the Renewable Energy Racers Set.